Brabantia supplies you with the best equipment for drying your laundry outside. The 'Lift-O-Matic Advance' rotary dryer can be operated ultra-lightly with the 'EasyLift' system: the rotary dryer is seamlessly adjustable to your own working height from 149 to 197cm (approx). Save space: 50 metres of drying length for a complete family wash on just 4,5 square metres! 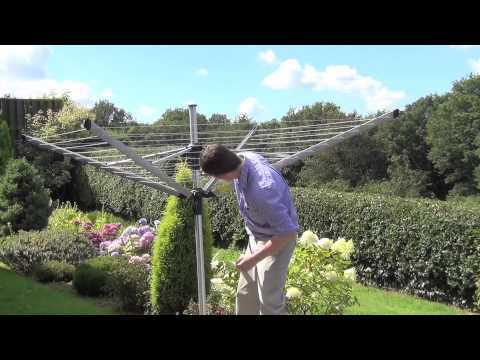 Washing lines can be retensioned so that they are always taut. Weather resistant - coated arms and extra sturdy main tube (50 mm diameter) made of anodised aluminium. Diagonal span width of 290cm. Now includes a peg bag and a protective cover. Diagonal span width of 290cm approx.